The snowy model I submit to you is a Danish nisse. These are the gnomes of Scandinavia. They have different names depending on which country you're in. Nisser (pronounced "niss-uh") are known in Norway and Denmark. In Finland these are known as the tonttuja, and in Sweden they are the tomtar. 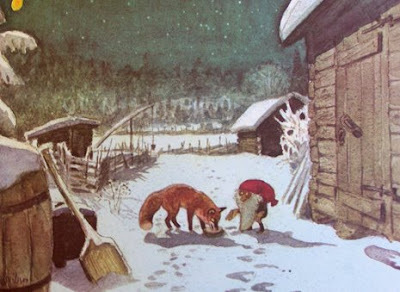 I learned about these little guys while reading up on Scandinavian Christmas customs (my wife is half Danish). An ancient tradition, the nisser have roamed the rural areas of the north since pre-Christian times. At Christmas the Jul nisse comes to your home expecting a bowl of rice pudding. If he is disappointed, then you can expect trouble! I don't really know where my model came from. It's just one of many miscellaneous minis that I have had for years. At left is a photo of the model before I stripped the factory paint-job and repainted it myself. My treatment mounts the mini to a 25mm round base with white-painted sand. The sand has an undercoat of light blue to give some depth to the white snow. It's always satisfying to refurbish a mini with a crumby paint-job! There are two lovely children's books about a nisse. They were written by the author of Pipi Longstocking, Astrid Lindgren. She is Swedish, so they books are titled the Tomten and The Tomten and the Fox. These are the same fellows that inspired the classic "Gnomes" fictional reference book and the childrens cartoon, "David the Gnome" where the main character was voiced by, of all people, Tom Bosley of "Charlie's Angels" and "Happy Days" fame. Love these characters and they even make an important appearance in an RPG I play with my kids called "Tales From The Wood". 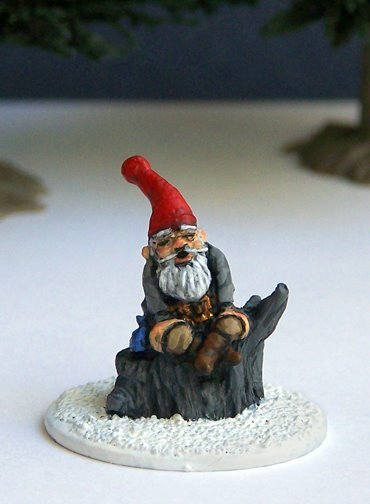 Oh yes, I remember David the Gnome. And I still have my Poortvliet gnome books. For some reason my dad was really into gnomes when I was a kid. I have been trying to track down those old Gnome books. Every time I find them they are priced for collectors. I may just pick up a reasonable bunc hof used copies for my own enjoyment.